Paneer Pakora recipe make an ideal snack with hot chai (tea) during monsoon or for any weather. They are crunchy from out and pillowy soft from within. Beat the chickpea flour with some water to make a thick batter in a blender for 4-5 minutes to incorporate air (this will make the batter fluffier). Let the batter rest 1/2 hour in a warm place. 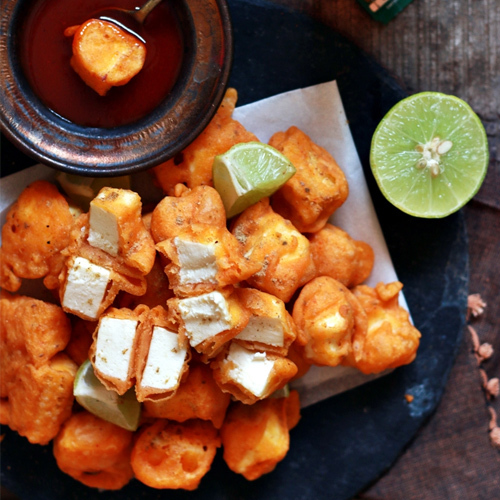 Dip the cubes of paneer in the batter. Deep fry in oil that is heated. Drain on paper towels and serve immediately. Serve the paneer pakora with coriander or mint chutney.